Achtung! German Body Comp training lets you gain and lose simultaneously. What more can be said about German engineering? It's brought us jet planes, Mercedes and BMW, Heidi Klum, and perhaps the all-time best body recomposition program in the fitness industry. If you want to gain muscle while losing fat and quickly reshape your physique, German body comp training is your blueprint. A scientist in Germany found that fat loss could be accelerated by raising levels of blood lactate—an energy substrate. More lactate corresponds to greater release of growth hormone, which tells your body to make muscles bigger and burn flab. The best way to raise lactate is to pair upper- and lower-body exercises or opposing movements for reps in the 8-to-15 range. The sweet spot for sets is three, and rests are short. It all makes for highly intense training that will leave you pumped and winded, putting you on your way to a body that people will want to study and duplicate. 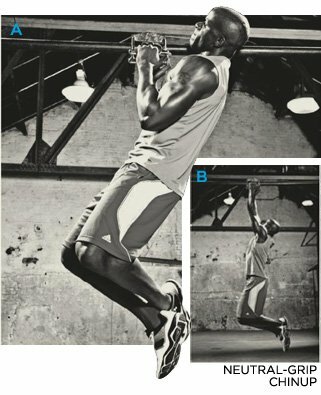 Perform the workouts (Day 1 and 2) in alternating fashion for three total sessions per week. Rest a day between each session. So in Week 1, you could do the Day 1 workout on Monday, Day 2 on Wednesday, and Day 1 again on Friday. In Week 2, you'd perform Day 2's routine twice and so on. Perform the exercise pairs (marked "A" and "B") as alternating sets. You'll do a set of A, rest, then a set of B, rest again, and continue for all the prescribed sets. The remaining exercises are done as straight sets. Each exercise is assigned a tempo. The first digit is the number of seconds you should take to lower the weight. The second digit is the time you should pause in that bottom position. The third digit applies to the lifting portion of the exercise, and the fourth is the length of pause in the end position. A zero digit indicates no time—simply move on to the next digit. 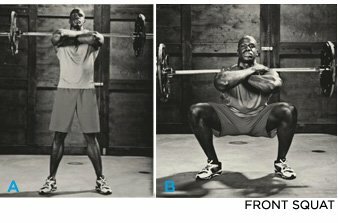 For example, a front squat with a tempo of 3-1-1-0: Take 3 seconds to lower yourself into the squat and pause for one second in the bottom position. Take one second to come back up to standing, and then go right back into the descent again. To increase the intensity of the workouts, decrease your rest period between sets by 15 seconds every two weeks that you do the program. Start by resting 60 seconds for the first two weeks. Then in Weeks 3 and 4, rest 45 seconds. If you choose to do the program for up to six weeks, drop the rest to 30 seconds between all sets. Stand with your feet between hip- and shoulder-width apart and your toes turned out slightly. Grab the bar so your hands are just outside your knees. Keeping your lower back in its natural arch, drive your heels into the floor and pull the bar up along your shins until you're standing with hips fully extended and the bar in front of your thighs. Lie faceup on a bench with a dumbbell in each hand. Turn your wrists so your palms face each other. Press the weights over your your chest and lower them back down. Come back up a quarter of the way, and then down again. Now press to lockout once more. 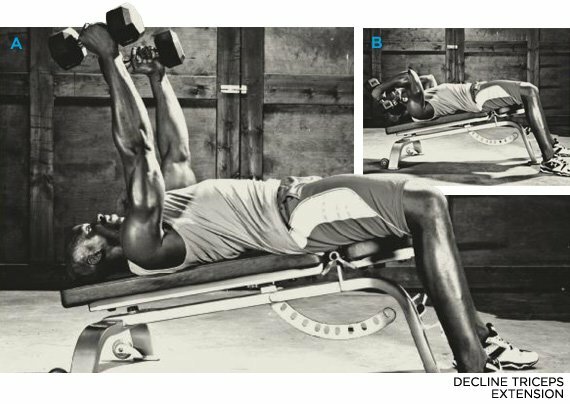 That's one rep. Take three seconds to lower the weights from the lockout position and two seconds when pressing to lockout. 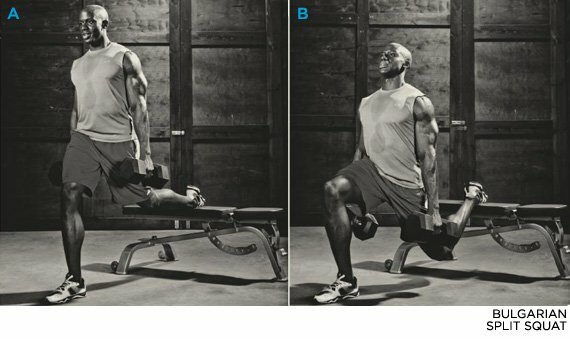 Hold a dumbbell in each hand and rest the top of your right foot on a bench behind you. Lower your body until your rear knee nearly touches, and your front thigh is parallel to the floor. 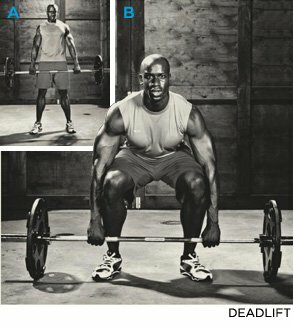 Set a barbell in a power rack (or use a Smith machine) at about hip weight. Lie underneath it and grab it with your hands about shoulder-width apart. Hang from the bar so your body forms a straight line. Pull yourself up until your sternum touches the bar. 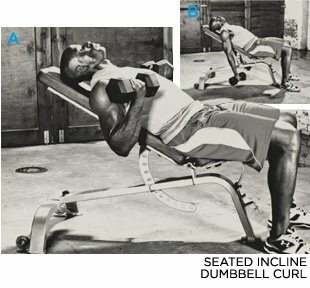 Set an adjustable bench to an angle and sit back against it with a dumbbell in each hand. Curl the weights to shoulder height without allowing your elbows to drift in front of your shoulders. Set a barbell on a power rack at about shoulder height. Grab the bar with a cross grip and raise your elbows until your upper arms are parallel to the floor. Take the bar out of the rack so it's resting on the fronts of your shoulders—as long as your elbows stay up, you'll be able to balance the bar. Squat as low as you can without losing the arch in your lower back. Hang from a chin-up bar with handles so your palms face each other (if you have only a straight bar, hook a V-grip cable handle over it). Then pull yourself up intil your chin is over it. Hold a barbell with a shoulder-width grip and bend your hips back as far as you can. Allow your knees to bend as needed while you lower the bar along your shins without letting it hit the ground. Keep your lower back arched and your chest up throughout. Hold a dumbbell in each hand and sit down on a bench with a back rest. Curl the weights up and then rotate your wrists so your palms face the floor. Slowly lower your arms back to the starting position. 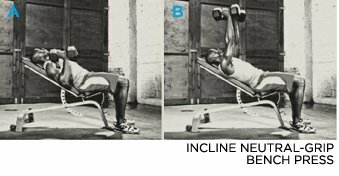 Set an adjustable bench to a slight decline and lie down holding a dumbbell in each hand. Press the weights overhead and then bend your elbows so you lower them behind your head. Keeping your upper arms stationary, extend your elbows to lockout. Attach a rope handle to the top pulley of a cable station. Get into a lunge position, resting your right knee on the floor. Pull the cable diagonally downward to your right side.